Back in the olden days (the 1970s), the grocery store bakery would give kids free cookies. Getting a free eat-while-shopping cookie was a ritual, which is probably why I like grocery shopping so much to this day. My chosen cookie was always chocolate chip, but my mother loved Rangers. So in honor of Mother’s Day, I made my favorite Ranger recipe and jazzed it up with a little butterscotch drizzle — Butterscotch Rangers. To keep the Butterscotch Rangers light and crispy like the grocery store’s, I used all-shortening. If you don’t like shortening, there are other recipes out there that use butter, but for this one I recommend all shortening or a combination of butter and shortening. To make the cookies a little more interesting I drizzled on a mixture of melted butterscotch chips and coconut oil (which, by the way, can be used as butterscotch Magic Shell, as a I found out last night). For the flour, make sure to either weight it or carefully spoon and scoop stirred flour into the cup. If you pack the flour too much the dough might be too dry. Preheat oven to 350°. Line two baking sheets with parchment or nonstick foil. Beat the shortening and sugar unti creamy. Add coconut and vanilla and beat until well mixed. Scrape sides of bowl and beat in eggs, one at a time. Add the baking soda, salt and baking powder and stir well, then add the flour and stir until incorporated. Stir in the oats, followed by the cereal. Batter should hold together and should not be too dry. Scoop up heaping tablespoons and shape into 1 ½ inch (1.6 oz) balls (this makes large cookies). Press them down to make discs. Arrange 9 to 12 on a sheet, spacing about 2 inches apart. Bake for 12 to 15 minutes. Makes about 24 to 30 cookies, but yield will vary depending on size. 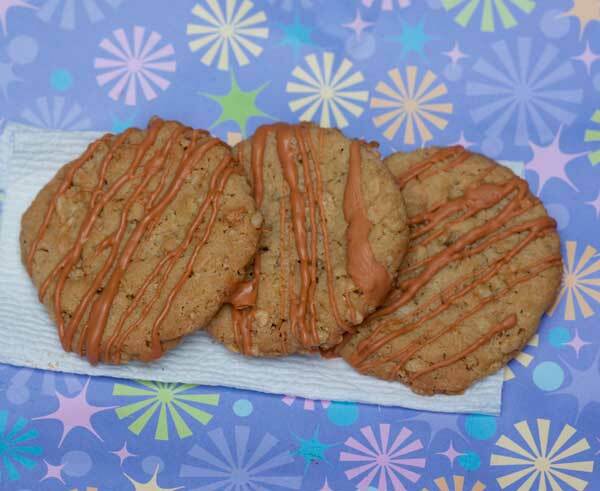 When cookies are completely cool, put the butterscotch chips and coconut oil in a disposable cake decorating bag or a heavy duty freezer bag. Microwave at 50% power for 1 minute to melt the chips. Massage bag lightly until chips are melted and smooth. Snip off tip of bag and drizzle over cookies. Put them in a refrigerator just until butterscotch chips have set. What a fun grocery store experience for a kid! These cookies sound really fun too!